Feast your eyes and ears upon yet another stunningly beautiful, positively dripping with tone guitar from the workshop of GW Barry! 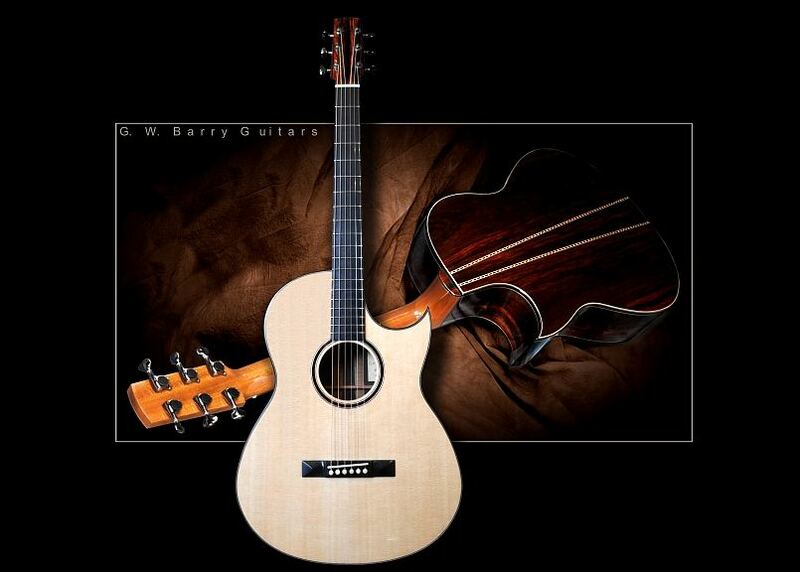 This custom guitar was built for 12th Fret teacher and finger style fanatic David Martin! Seeing and hearing this guitar flat out left me speechless so I had to ask Gordon and David to help explain the design elements and tone concepts behind this masterpiece. Thanks guys! 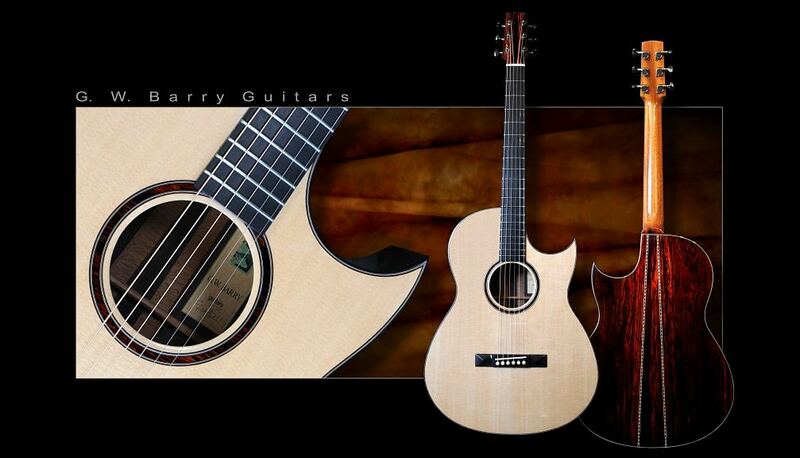 Dave Martin’s new Barry is a confluence of modern steel string concepts and traditional classical guitar proportions. The twelfth fret neck joint and smaller body not only centers the bridge in the lower bout, but also balances the instrument physically in a natural and more effortless playing position…The deep Florentine cutaways retains all the needed access to higher positions on the fretboard. 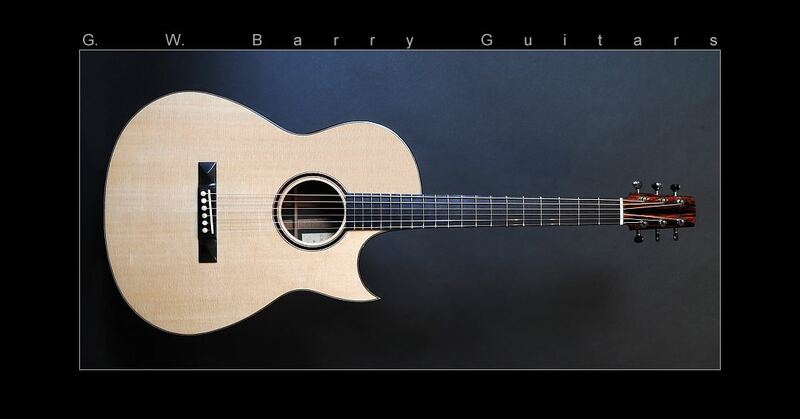 A slimmer “pyramid” style bridge torques the 15″ wide lower bout more aggressively adding substantial “throw” or “pump” to this smaller body shape… The sideport, in turn tunes in the player to this at once balanced, airy and chimey response… so well suited to Dave’s magnificent open tuning finger-style pieces. 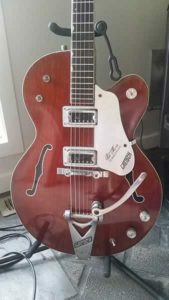 “The idea for this guitar really came out of a series of conversations Gord and I had about 12 fret guitars and fingerstyle playing. The main sonic appeal of the 12 fret design to my ear is that my right hand naturally falls further away from the bridge than it would on a standard 14 fret neck joint. This slight change in right hand placement really makes a big difference to me, I find I prefer the increased complexity, depth and just the overall sound I get from being further from the bridge. A cutaway was a must for me and since I have always liked the look of the Florentine cutaway that feature was added to the body shape. The sideport on the upper bout was a complete no brainer as I have yet to play any guitar that sounded better with its sideport closed or covered than with it open. Gord selected a series of different back and side woods for me to look at but when he tapped the Brazilian that we ultimately used it was just no contest, this particular set was just so much more musical sounding than the rest. Gord continued the Brazilian theme with a beautiful headstock overlay and Rosette that really appeals to my sense of understated beauty in the overall aesthetic of any guitar. Special thanks to David Wren for the lovely photos!